After an eternity waiting for my film to come back from the lab, and another eternity of scanning and processing the best shots, I’ve finally posted my gallery of Norway photos! In the two weeks since I’ve been back home from Norway, I’ve taken the dive head-first back into work-mode, including the fun but tedious process of sorting and sifting through the thousands of photos I brought home. Believe it or not, getting back to work on the computer hasn’t been all that bad; in fact it’s been almost a welcome change after six weeks of pushing it in the mountains of Norway. I think I got my fill of hiking for while; in fact I haven’t even been hiking yet since I’ve been back in Colorado! No, so far I’ve been perfectly content to just be lazy and hang out with my friends again as much as possible. Though I did a lot of hiking in Norway, I also had a lot of downtime, whether tentbound in the rain or driving endless hours on winding roads. The hiking and photography were no doubt amazing, but I often felt an overwhelming boredom and loneliness during those downtimes. Sometimes I felt like the trip was characterized more by the boredom and solitude than the joy of hiking and photographing the mountains there. As for the photography itself, I can say that Norway is one of the most photogenic places I’ve ever been. Not only are the mountains incredibly unique and full of character, but the weather was usually very dynamic. And of course the 24-hour light and long sunsets/sunrises are an absolute blast for hiking and photography. My photographic style already tends to heavily favor the “grand scenics” – the big landscape shots – and Norway offers more of that than I could handle. So you won’t see any artsy “intimates” in my gallery… I was too busy trying to fit the landscapes into my wideangle lenses! Ok, enough rambling, check out my photos from Norway! Posted in Norway and tagged Norway on September 10, 2009 September 11, 2009 by Jack Brauer. ← Previous: "Ice in Morocco"
Freakin’ awesome!! Man, I just love looking at your pics and learning from your vision..
Beautiful images. Norway is going on my list of places to go. Yaay! Awesome! Trollvegen Mist may be my favorite, though they’re all stunners. Processing from a big trip is a real challenge for me. I’ve still only scratched the surface of my Dinosaur and Selway shots from this summer, and my backlog just gets longer and longer. It’s going to get worse before it gets better too. I don’t know how you pros do it. That’s a GREAT collection of images, Jack. What an awesome place. Awesome shots as always Jack! What program do you use to do all that processing? Yair – I sort all my digital image files manually into different folders based on the hikes or photo shoots (the film ones by just creating lots of piles on my desk). Then I just pick the best shots from each shoot. I use Olympus Master software to process the RAW digital files, with very little editing at that point besides maybe adjusting exposure values. Then I process all the images in Photoshop. Some require very little adjustments; others require more attention for things like pulling out shadow detail in certain areas, or adjusting color balances, or manually blending dual-exposures. At this point I’ve just posted my favorites from pretty much one round of browsing through the images. Usually after several months pass I’ll go back and find a few good ones that I missed the first time. These are absolutely gorgeous photographs. The detail, light and color are amazing. You took great care in all these shots, truly amazing, thank you for posting them. Your Norway photos are breath-taking, heart-stopping, unbelievably shockingly stunning! You really have a gift….and thank you for your preserverance and endurance: hiking, climbing, camping, and carrying heavy loads to bring these gorgeous places to the arm-chair mountaineers of the world. I love Norway; I’ve been from the southern tip to Tromso and seen and love so much there, but you have captured so much more! Now you’ve convinced me I need to visit the Lofuten Islands.! My trip to Tromso was in November to experience the magical light and long shadows of the sun which hardly makes it above the horizon………..and to dance to the spellbinding Northern Lights directly above and all around, especially on the frigid deck of the Coastal Express ship as it made its rounds south through the islands and back to Tromso at midnight. As always you told a great story along with your spectacular images. I wish I had your energy and drive. Viewing your pictures, I was speechless !! Stunning work, as always. 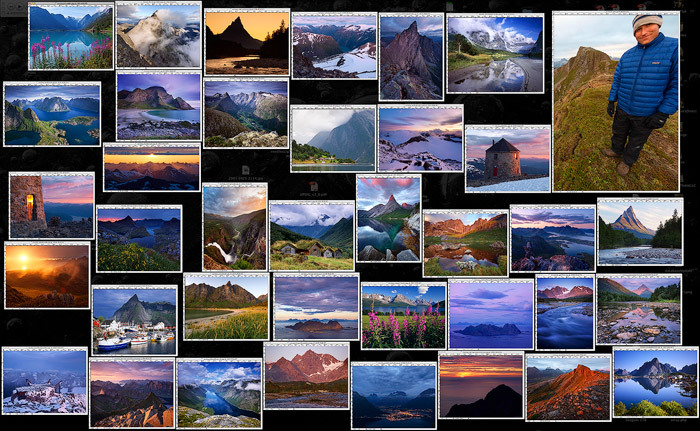 I hadn’t the slightest idea there was such spectacular scenery in Norway until I saw your gallery. Wow! I think my head may explode after viewing that body of work. Holy cow, all from one trip ~ Congrats on so many levels. Jack, AMAZING work. I am still picking my jaw up from the floor. Your photos are inspirational and amazing…wow. Damn. I’m going to have to look through ’em again. Keep it up and congrats on a successful photo trip! Man…man…man…I’m speechless. You have outdone yourself. Words can’t come close to explaining the beauty you have captured in these images. You have captured moments that have left me truly speechless. If I had to pick a favorite, I’d say Sunnmore Sunset…one of my all time favorites of yours. Excellent, Jack. “no pain no gain” so goes the saying and your picture proves it. As a norwegian I’m enyoing seeing my country through american eyes. You make Voringsfossen a new watherfall for me since I normally see it from the road and throu the canyon. Stetind is new to me and you captured it beautifully. Norway Is photogenic and I wish more american landscape photographer could take the trip over. These images are beautiful! What an amazing place! I really liked Trollveggan Mist, Sunnmore Sunset and of course Reine Panorama. Beautiful shots. Thanks for capturing them. The commentary makes me feel a little closer to being there. Great images Jack. Radical! Did you see anyone jumping off fjords? I heard wing suits are super hip there. Nice work man. The pics are awesome 🙂 I love the picture from Vøringfossen. I remember I told you, you would pass this place on the way over hardangervidda when we had dinner. Good thing you found it, because its a stunning photo. Your photographs are stunning Jack – I’m surprised your profile isn’t higher in the world of photography. I was in Norway for three weeks during the summer and know that even in that beautiful land making fine photographs isn’t easy. Your website is one one of the best out there – extremely well constructed. But I think it may well create a real tension in those who are considering taking their photography more seriously. On the one hand the pictures are remarkable – a true inspiration. On the other hand, reading your blog makes it clear that they’ve only been achieved through a great deal of time, effort and sheer physical graft – and probably moments of risk too. Anyway, thank you for sharing your vision of these places with everyone!